As a novelist, Jane Austen dealt in the little things that loom momentous in the everyday routines of an ordinary life: preparations for an outing, the choice of partners at a dance, the chance for intrigue in a game of cards. What we know of her life is drawn to the same miniature scale: small facts and slender insights hoarded, vetted, and handed down by a protective family who memorialized and effaced their famous aunt in equal measure. We have the six novels, all published in an intense seven-year period; some 160 letters, survivors from a much larger correspondence; and a little more than 1,100 pages of manuscript writings — apprentice pieces, experiments, and unfinished works — stretching over thirty years. Austen died aged 41 at the height of her powers. There’s much more that we would wish to know, and it’s not impossible that new evidence might emerge to challenge our assumptions. But with the exception of Jan Fergus’s important study, Jane Austen: A Literary Life (1991), biographers, instructed by the Austen family’s example, have paid more attention to the personal than the professional context when it comes to drawing a life. There are good reasons for this: if Austen is glimpsed within family accounts only in the most confined of settings, she vanishes almost completely under a more public scrutiny. Henry Austen’s story of his sister’s refusal to meet Madame de Staël is, in its sheer perverse negativity, a quintessential Austenian biographical detail. Might we, with the help of a non-family archive, turn it around? Might a context in book production rather than the cult of domestic personality yield, for this detail and for others, something more to the purpose in tracing the life of a writer? Fergus examined publishing house records (Longmans, Hookham and Carpenter, and John Murray) to begin to address Austen’s options as a professional woman writer. The archives of the Murray publishing dynasty, now housed in the National Library of Scotland, are among the most extensive in the British book trade. John Murray II was Austen’s second publisher, bringing out Emma, a second edition of Mansfield Park, and the posthumous Northanger Abbey and Persuasion. Murray II’s Sales Subscription Books, Commission Ledgers, and Copies Ledgers offer evidence, now widely disseminated thanks to Fergus and to David Gilson’s Bibliography of Jane Austen (1982; corrected edition, 1997), for production costs, sales, and profits of those novels Austen published with him. 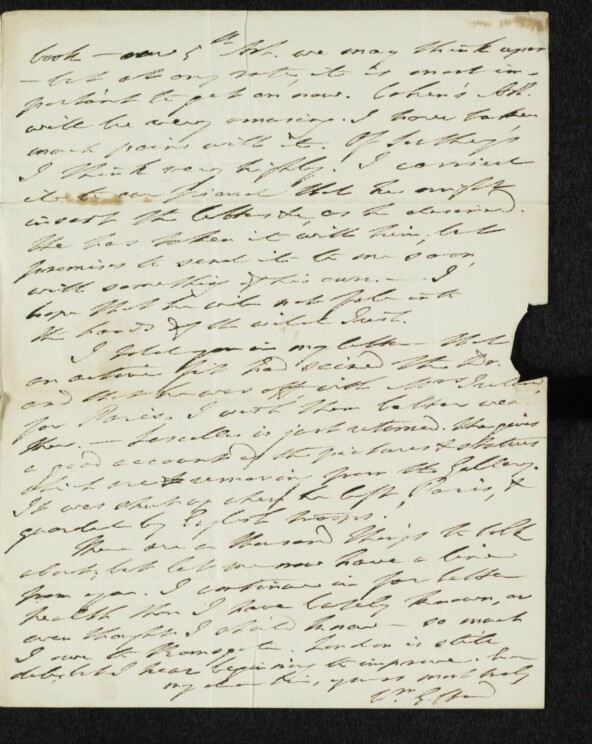 The John Murray Archive also contains well-known items of more personal note: a few letters from Austen to Murray, two more letters, less well-known, sent after Austen’s death, by her sister Cassandra, the copy of a cheque made out to Miss Jane Austin (sic). What if the Archive holds more? Since working on the differences between the first- and second-edition printings of Mansfield Park, I’ve had a hunch that William Gifford, editor of Murray’s Quarterly Review and his regular advisor, might be more significant than we’ve realized in Austen’s career as published novelist. Austen acknowledged him in the dubious context of her burlesque ‘Plan of a Novel’ and critics have regularly quoted Gifford’s few Austen-related snippets abridged in Samuel Smiles’s Victorian biography of John Murray II (A Publisher and His Friends, 2nd edition, 1891). But Gifford’s wider correspondence with Murray has remained largely ignored. His papers have scarcely been touched. Gifford’s crabbed handwriting, the classification-defying range of the topics covered in each letter, the sheer size of the Archive, are all sufficient deterrents. A page from Gifford’s 29 Sep 1815 letter, reproduced by kind permission of the Trustees of the National Library of Scotland. But this too might be turned to some purpose: a means to situate (as opposed to isolate) Austen, by requiring us to see things from Gifford’s perspective rather than from that of family record or of the great writer she would later be recognized as being. Gifford was a key figure in Murray’s modern publishing enterprise: a professional reader for the press, a man with a finger on the literary pulse of his time – a judge of good writing and of what would sell (not always the same thing). What do we learn about Austen from Gifford’s correspondence with Murray? Thanks to Gifford, we can make a case for 1814 as her annus mirabilis, as the year when she is poised to switch from Egerton to Murray. We hear her being assessed in the context of other, better- and lesser-known writers: Gifford’s acerbic verdict on Helen Maria Williams as a stylist, his analysis of an unknown female writer of pulp fiction, his admiration of Mme d’Arblay (Frances Burney), the literary star of the day, and his curt rejection of Frankenstein. We learn that Murray, unsurprisingly, wanted to get his hands on Pride and Prejudice, and that Gifford suggested he pay less for the manuscript of Emma than he originally planned. We find, in fuller form than Smiles gives it, Gifford’s critique of Austen’s writing and his financial estimate of its worth; the beginnings of the bargaining around production costs that end in the more widely referenced accounts from the Murray Ledgers. With such details, we add a few more to those little things that constitute our knowledge of Jane Austen. And, in shifting perspective, we locate her more securely in a contemporary professional context. Kathryn Sutherland is Professor of Bibliography & Textual Criticism, University of Oxford. Her publications include: “Jane Austen’s Dealings with John Murray and his Firm” in the latest issue of The Review of English Studies — available to read for free online for a limited time; Jane Austen’s Textual Lives: From Aeschylus to Bollywood (OUP, 2005); and, as editor, a Digital Edition of Jane Austen’s Fiction Manuscripts (2010) and A Memoir of Jane Austen and Other Family Recollections. She is currently preparing a full facsimile print edition of the Austen Fiction Manuscripts in four volumes with OUP. It is very hard to understand what Kathryn Sutherland is trying to say in this article. She seems to switch ideas every paragraph and what she is trying to say is very obscure and unfocussed. 1814 was hardly an annus mirabilis for the author, as she had been dead for a year. She writes “it’s not impossible that new evidence might emerge to challenge our assumptions”. If it did, I expect she would ignore it. If she is really interested in new evidence, I would advise her to read my recently published book “Jane Austen – a New Revelation” in which I prove that the novels of Jane Austen were written by her cousin Eliza de Feuillide. Jan Fergus has a hobbyhorse that Jane Austen was a professional writer, but there is no evidence for this. Most of the Jane Austen novels took ten to fifteen years from inception to publication and the income received from them was pitiful. If the novels had been written by a professional writer, she would have starved. I see no evidence that William Gifford had much influence on the Jane Austen novels, as there is little significant difference in style between those published by Egerton and those published by John Murray for whom Gifford worked. The commercial dealings between Jane Austen and John Murray for the sale of the books after Eliza’s death in 1813 have little relevance to the contents of the books themselves.